This bracket DOES NOT fit if you have the factory ground effects or 1LE performance package. Please order the Hot Wheels bracket. (See Related Products at the bottom). STO N SHO™ is an aftermarket detachable front license plate mounting system that is designed for those cars whose appearance would be ruined by use of the factory mounting location. Stay in compliance with state law by simply STOing your front license plate when you want to SHO the beauty of your car. 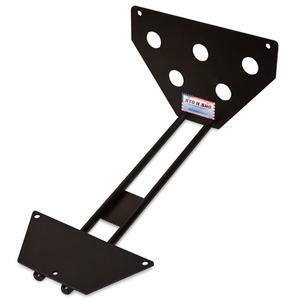 STO N SHO™ is a two-piece detachable mounting system consisting of a front license plate holder and a base mounting plate. The STO N SHO™ aftermarket detachable front license plate bracket mounting system is manufactured in the USA using quality materials and parts. The front and base plates are precision laser cut and hand burnished. Each tube and rod is machine cut and hand cleaned. Each STO N SHOTM aftermarket detachable front license plate bracket mounting system is expertly hand welded and drilled. After it’s assembled the base plate welds are ground smooth. The bracket then receives a coat of high quality automotive trim black paint. The final step in the process is to install the pull pin and test the product. While the bracket may look simple in appearance, a lot of time and work goes into making each STO N SHOTM aftermarket detachable front license plate bracket mounting system to ensure you receive a quality product. STO N SHO™ requires small holes to be drilled on the underside of your vehicle. These holes are not visible and in no way detract from the look of your car.